I have a confession. While I can’t help but love Snow White’s clumsy, innocent friend, Dopey, Grumpy is possibly my favorite. Maybe it’s because whenever I see someone who is less than cheerful, I simply want to make them feel better. I actually have a Grumpy baseball cap that I like to wear when I’m driving my convertible because it’s impossible to be grumpy when you’re driving with the top down! Snow White and the Seven Dwarfs are an iconic part of the Disney universe. It’s one of the first Disney stories I remember reading. When USAopoly came out with a game built on these characters, I swooned. When I looked at the box, I immediately commented how much it looked like Quartz from Passport Game Studios. That’s when they told me I was spot-on. 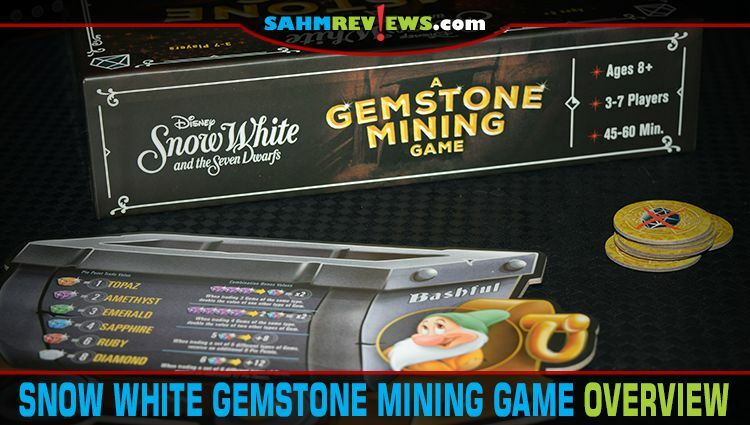 Disney Snow White and the Seven Dwarfs A Gemstone Mining Game is actually a licensed version of Quartz with some modifications to incorporate the Disney theme. The game plays generally the same as the original but I’ll recap here. 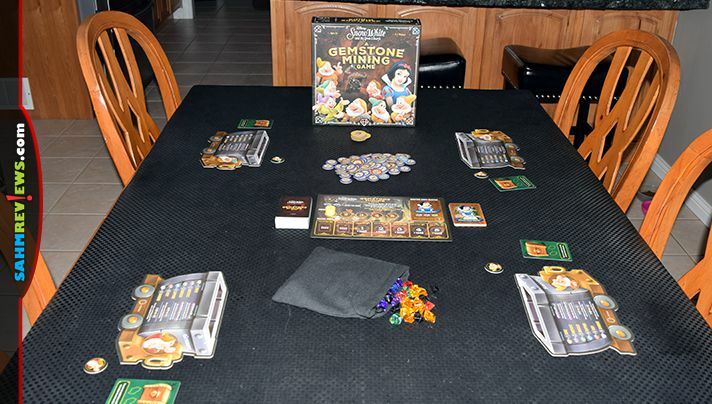 Begin by placing the Main Game Board in the center of the table with the Day Marker on the first Mining Day. 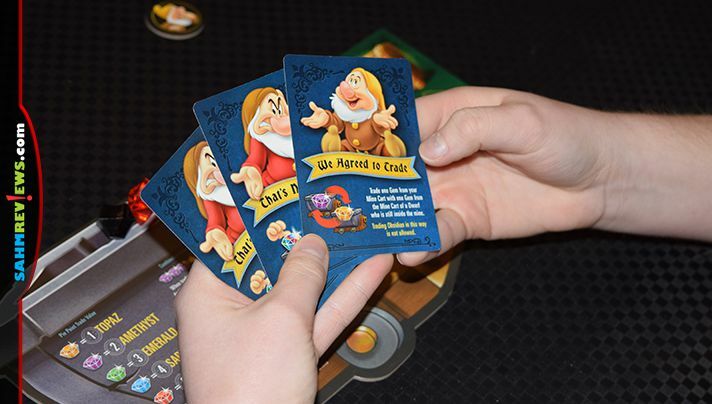 Each player selects a Dwarf, the corresponding token, five Action Cards and 1 Chest Card for reference. Place all the gems in the Mine Bag and shuffle the Action Cards. 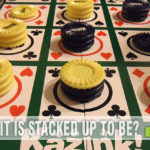 Deal five Action Cards to each player then place the remaining in a stack to the left of the board. Make community piles of Pie Points and Experience Tokens alongside the board then make a stack of shuffled Snow White Cards on the right of the board. 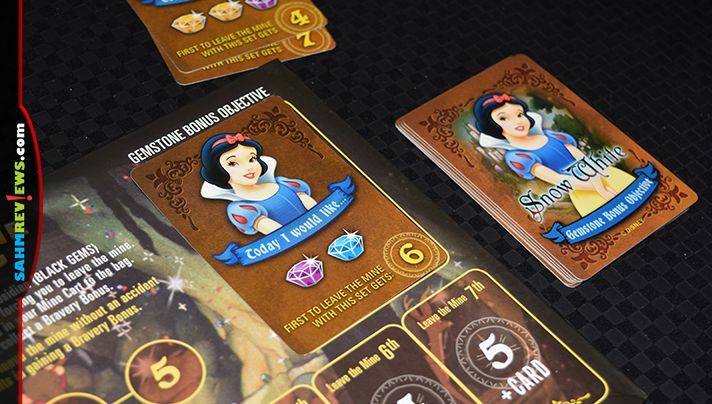 Disney Snow White and the Seven Dwarfs Gemstone Mining Game consists of five rounds to represent five days of work in the mine. You and up to six friends (Seven Dwarfs, you know!) 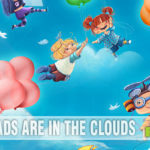 are working to collect gems, safely exit the mine and earn Pie Points. 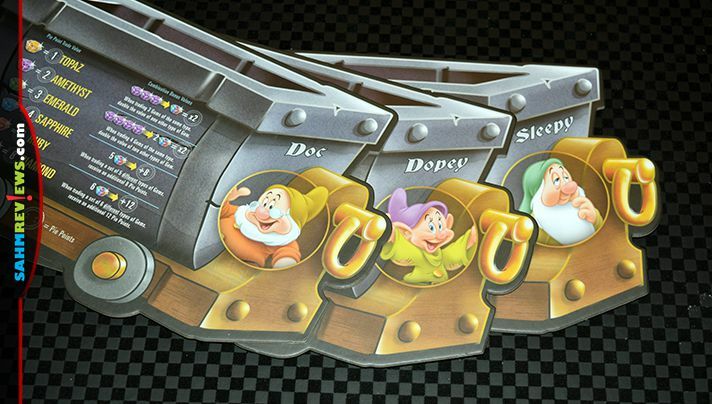 A Snow White Card is revealed at the beginning of each round indicating an assortment of Gems. These are the ones she covets most this round. While the work day ends when the last Dwarf exits the mine, only the first Dwarf to exit with that combination earns bonus Pie Points. You’re probably wondering how you can get those gems and make Snow White happy! On each turn, there are three options of what to do: (1) Mine a gem, (2) Play an Action Card or (3) Leave the mine. 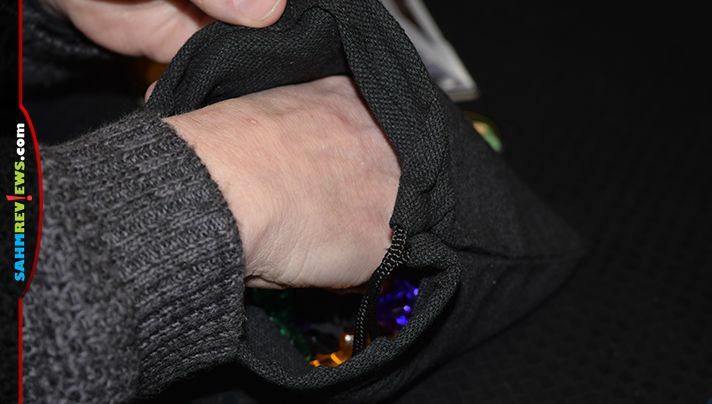 Inside the Mine Bag is an assortment of gems including several colored gems of value along with several pieces of worthless Obsidian. To mine a gem, you simply draw one out of the Mine Bag and place it in your Mine Cart. Successfully mining valuable gems is the goal, but if you end up with two Obsidian then an accident occurs and you’re evacuated from the mine without any gems. The day wasn’t a complete loss… You’ll receive an Experience Coin as a token of Snow White’s appreciation for your hard work. 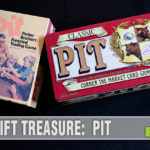 At any point in the game, you can turn in an Experience Token to remove an Obsidian from your cart or save it until the end of the game and receive three Pie Points. A second option is to play an Action Card. These cards have a variety of functions including allowing you to take a valuable gem from an opponent, give an opponent an Obsidian from your cart, forcing other players to discard a valuable gem or draw three gems from the bag, keeping the valuable ones and returning the Obsidian to the Mine Bag. An advanced version of the game includes Reaction Cards that allow you to block another player’s Action Card. The final option is to leave the mine which ends your turn for this round. All the gems in your cart are safe and will earn you Pie Points at the end of the day. You’ll earn Bravery Bonuses based on how long you stay in the mine. The longer you stay, the greater your reward. Of course, the longer you stay, the less likely you’ll be the one to earn Snow White’s Pie Bonus and the more likely you’ll end up with Obsidian! Like all press-your-luck games, it’s a balancing act of when to stay or go. Everyone takes turns in order until all Dwarfs have left the mine. The last Dwarf to leave will be the first to enter the Mine the following day. 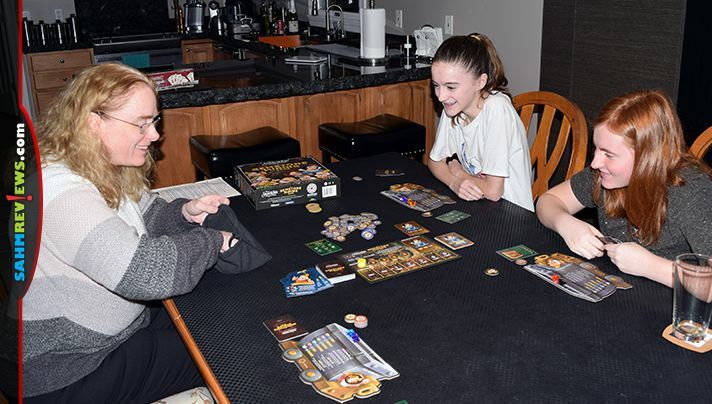 Once everyone is out, Dwarfs take turns trading gems with Snow White. 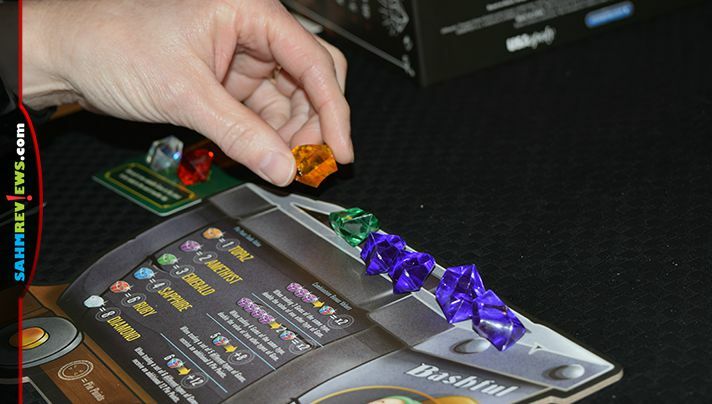 Each color of gem has a different value as indicated on the Mine Cart with some combinations of gems offering a bonus. Calculate your total gem value and receive Pie Points in exchange. If you’re not ready to turn everything in, you can place some in your Treasure Chest to exchange in a future round. At the end of the 5th Mining Day, all remaining Gems are traded for Pie Points. Pie Points are totaled and the Dwarf with the most is the winner of Snow White and the Seven Dwarfs Gemstone Mining Game! 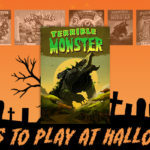 USAopoly (aka TheOP) continues to release quality games with Pop Culture themes including Marvel, Disney, Nightmare Before Christmas, Harry Potter, Fantastic Beasts, Disney Kingdom Hearts and more. They regularly publish games relating to current blockbuster movies too! If you want to know about the latest news and excitement from TheOP, be sure to follow them on Twitter and Facebook. 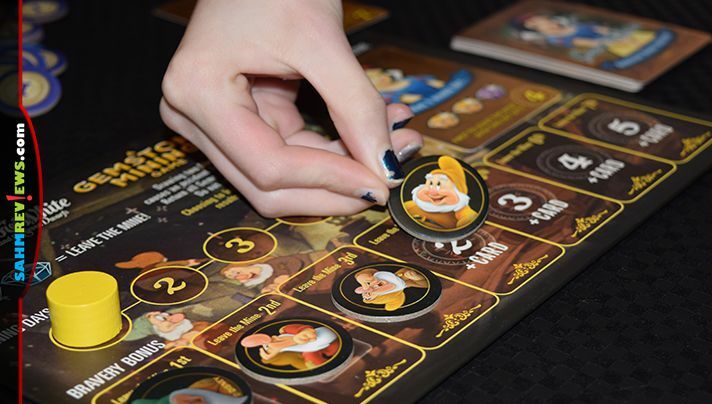 Disney Snow White and the Seven Dwarfs A Gemstone Mining Game is perfect for the Disney fanatic in your life and a great way to introduce new people to modern board games. Pick up a copy before your next viewing of a Disney movie or pack it for your next trip to Disney! My favorite has always been Grumpy. He’s one guy who really thinks about things.